This painting, part of my “South Beach” series (for other examples from this series see Avalon Olds and Miami Chevy), depicts a 1938 Oldsmobile parked outside the classic historic Park Central Hotel at 640 Ocean Drive in South Beach, Miami. The hotel was designed in 1939 by Henry Hohauser, one of the foremost architects of the art deco movement, and is widely regarded as a shining example of his work – a jewel in the crown of Miami Beach hotels. 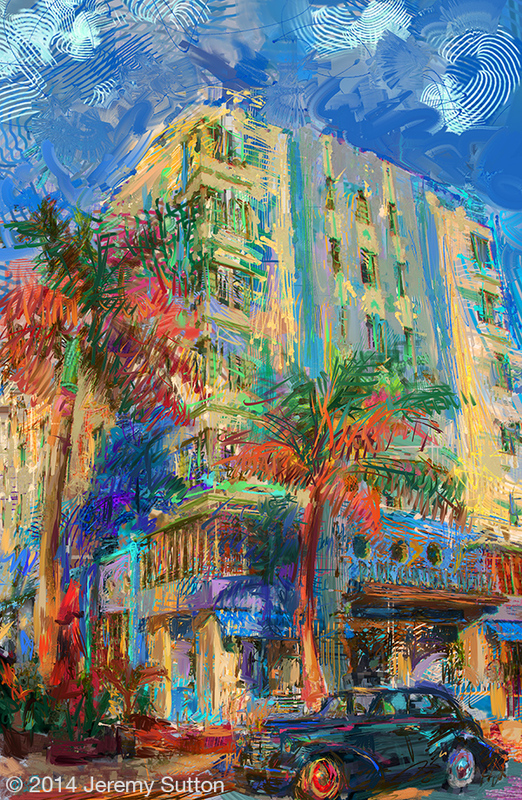 The painting is based on a series of photos I took when walking along South Beach early one morning. I was inspired by quality of light, the color and shapes of the buildings, the style and character of the car, the reflections in the windows, the majesty of the palm trees and their shadows on the building. The workflow, tools, process and techniques behind the creation of this painting are the subject matter of a new series of Painter X3 video tutorials I am presently uploading onto this site (under the section Painter X3 In-Depth).